The move marked the latest sign on how Lakers coach Luke Walton has accelerated his shift toward developing his young players. It also marked the latest sign of the Lakers’ stock plummeting on reserve forward Luol Deng, whose four-year, $72 million has yielded only a 7.6 points per game average on a career-low 38.6 percent shooting in his 13th NBA season. 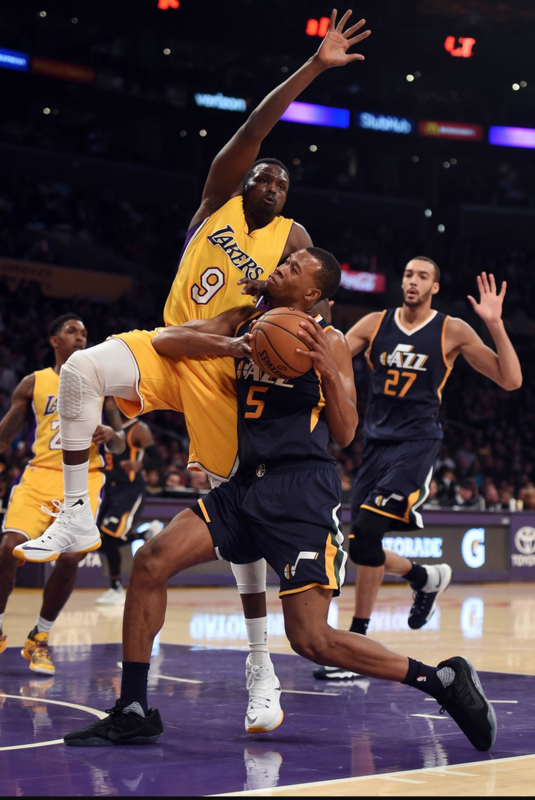 Deng originally lost his starting spot on Feb. 6 against New York in favor of rookie forward Brandon Ingram. After averaging 4.1 points on 27.8 percent shooting in 21.3 minutes in seven games off the bench, Deng sat Tuesday’s game against Charlotte because of a coach’s decision. Walton cited the need to play Ingram, third-year guard Jordan Clarkson, newly acquired guard Tyler Ennis (from Houston) and newly acquired guard/forward David Nwaba (signed to 10-day contract). It is not clear what Deng’s status will be when the Lakers (19-43) host the New Orleans Pelicans (24-38) on Sunday at Staples Center, or if either Walton or Deng would be open toward him playing on even more reduced minutes.